Imagine it. You're in the woods with a group of friends, you've just watched a scary movie and your imagination is running wild. You hear noises around you. A twig snaps. The wind causes the material on your tent to flap. Your heart beating hard, you look around and... laugh as you realise you're having the best halloween weekend ever! 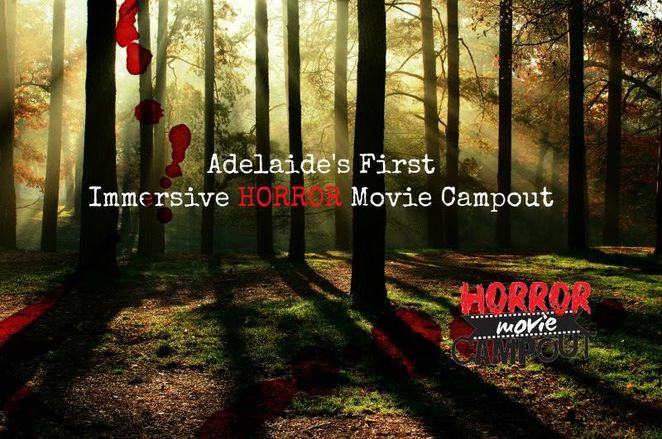 Adelaide's first ever Horror Movie Campout is going to be held in a secret location (to be disclosed closer to the date) in the Adelaide Hills and it's a weekend not to be missed. Tickets start at $150 and include entry for up to three campers (festival style tent provided) including a horror movie marathon on a massive outdoor screen. The marathon includes two full length movies (one will be 'The Exorcist' and the second will be voted for by campers on the Facebook page closer to the event) as well as short horror films. Looking for something with a little more luxury? 'Glamping Permits' can be purchased for $195 which includes the same as the $150 tickets but as well as that you can expect express entry, VIP seats close to the big screen, a VIP campsite and a $15 food and drinks voucher for the campsite per tent. Scare actors will be on site to keep you alert and marshmallows are a must. Hot food will be available for purchase but a change of pants is up to you to organise! Part proceeds from ticket sales will be donated to The Hutt Street Centre so as well as having a great, unique weekend, you're helping a good cause. Tickets go on sale mid July and will sell out fast. When available, they will be sold through the website but if you register your interest now you get a $15 discount off your ticket. Numbers are limited due to camping permits so get in as soon as you can or spend your Halloween hiding with the curtains drawn from trick or treaters instead (I know which I'd rather be doing).